August 22, 2013, 9:10 PM · When my son was a little tot playing piano, we took a marvelous course at the Suzuki Institute of Southern California in music reading. It was full of intuitive and engaging games, meant to teach theory concepts to pre-music readers as young as my then-five-year-old, and younger. These games were part of an evolving program called Music Mind Games. He loved it, I loved it, and I immediately started incorporating little bits of it into my teaching. "One day," I said to myself, "I should seriously look into this as a teacher!" Now, nearly 10 years later, the day has come. Suddenly I'm to teach a "Music Mind Games" course for my Suzuki group, Suzuki Talent Education of Pasadena, as my colleague who had been teaching it is on maternity leave. We've been offering this class for just a year as a theory supplement for our Book 1 students, and they have taken to it with tremendous enthusiasm. Not only that, but their reading, solfege and theory skills are getting pretty impressive! Thus, I found myself last weekend at a one-day "Music Mind Games" workshop, given by Alyse Korn at the Little School of Music in Valencia, Calif.
"Music Mind Games" is the brainchild of Michiko Yurko, whom I've not met but hope to. She clearly is one of the more creative and brilliant people on the planet. 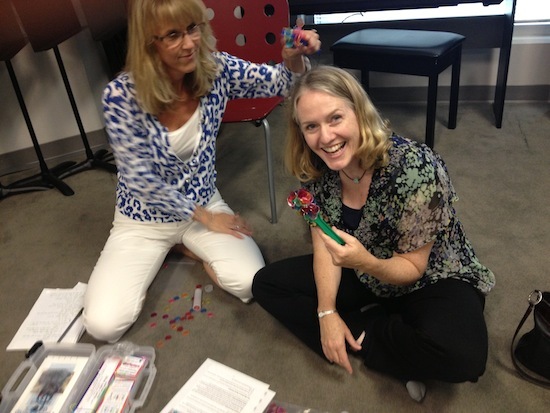 She has come up with some 300 games to help young children learn music reading and theory. For the workshop, we were required to buy and bring $90 worth of materials. Confession: When asked to buy pricey materials up front, for anything, I go a little cross-eyed and get very skeptical. This better well be worth it! The good news is that you don't necessarily have to buy the materials to play the games. Michiko's Music Mind Games website is an astounding resource, with videos demonstrations of many of those games. Note the color-coded solfege cards, which match the colored discs. (In this game, they use "G" for "do" because it puts the notes in the center of the treble-clef staff.) The child chooses a square from the big bingo card on top and places a little plastic animal in that square. 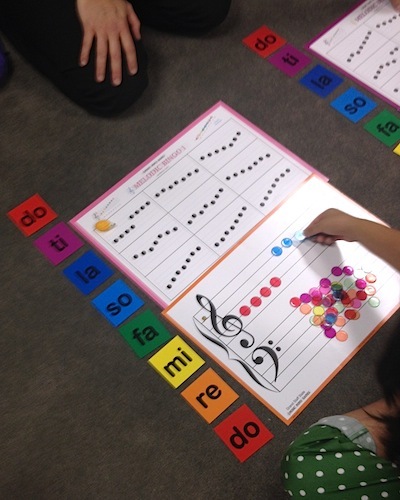 Then he/she copies groups of eight notes from the card on top to the staff on the bottom, using those little discs that coordinate colors with the solfege cards, which they have lined up in order next to their staff. The games remind me of Montessori, with lots of built-in kinesthetic learning. When it's all over, those little discs are magnetized, and you can pick them up with a magnetic wand that attracts them like fly paper. Getting serious again, one of the most useful and clever things that Michiko has come up with is a vocabulary to go with various rhythms, and she calls this "Blue Jello." Conveniently, you can find a PDF of all her "Blue Jello Vocabulary" on the Internet. Quite some time ago, I printed out the page of words and hand symbols and placed it on my studio wall. Since my students have known much of this vocabulary since that workshop that I attended long ago, we sometimes just stop when they have rhythm trouble and I say, "Let's just do Blue Jello." It's like fix-it glue: problem solved in a matter of minutes, whether it's elementary reading, figuring out La Folia or working on advanced orchestra music. Here is another video in which a girl named Anna, 11, uses the vocabulary in learning Mozart Sonata K. 330. In all, I'm very grateful to Michiko for coming up with these clever ways to introduce music reading and theory, so that those who start violin young can also start their reading, right from the beginning! August 23, 2013 at 08:10 PM · Judging by the pic of you, Laurie, I would say your mind has definitely been warped by the games you have played (insert smiley face here). August 23, 2013 at 09:19 PM · I confess, Tom, we were getting a bit punchy! August 25, 2013 at 08:48 PM · In my youth, Laurie, anyone seeing that pic would immediately ask you where s/he could get some of the great sh*t you were doing.